Monday's ugly little sister, plus Juneteenth, and Martini Day. What fragrance are you wearing? I'm Annick Goutal Mandragore, because Jirish wore it yesterday. Tea at the moment is a Ceylon from Lumbini Estate, via Upton. Note: the Dancing Magnolia teapot in Aqua ("Taking cues from the geometric marvels found in nature, this collection of teapots, tea for ones, cups & saucers, milk jugs and more comes in five stellar colour combinations. Perfect on their own, or all mixed up, this fine bone china collection has all the marks of a daily tea time favourite!") is $62 at T2tea. Strongly suggest that you stay off that website then — it is one of MANY lemmable designs, in every color you can think of. Yes! I’m a regular there.. love their teas! Daaaang! I went to the website. Now I want teapots and tea. You warned us…???? I got lucky — there are so many teapots I want that I am utterly unable to choose, and will not buy any. Enjoy the World Cup! My oldest is home from college this summer and he’s been showing me the highlights and telling me about the games when I get home from work. You smell great. Enjoy your soccer and tea! It’s funny how much you are enjoying the Worldcup. I had completely forgotten that it was happening as this is the first time in years that the Netherlands are not participating so all is very quiet on the football front. No orange everything in supermarkets and shops. I don’t mind but I love reading your posts about it. I miss seeing Netherlands’ orange jerseys. To console myself I cheer for Sweden. To be honest, I´m rather glad we didn´t make it. Such a bunch of spoiled brats most of the time and apart from winning the European Championships back in the eighties, it mostly seems like much ado about nothing to me. Still glad that the Dutch team has some fans abroad. you smell great! yay world cup! I’m for Portugal! These picture challenges are sort of beyond me, I’m afraid. I will make an effort for Friday. I’m wearing the very glamorous and lived in Jubilation 25. It’s wonderful. Love that teapot, Robin and it goes very well with your scent of the day. I agree on both points- regarding matching perfume to a picture, my mind just doesn’t work that way; and Jubilation 25 is definitely wonderful. I feel really challenged by a lot of the CPs, and often at a complete loss. The picture challenges can be a bit tough for me unless I have a visceral reaction. I know some people like it and some don’t — always ignore any project that doesn’t work for you, who cares? Nobody is keeping track. I know, but still, I mostly try to at least stick to it at least once. Is your Ceylon from your latest Upton order? I’m drinking a wonderful Earl Grey myself: Earl Grey Fleur Bleue from l’Univers du Thé in Brussels. They carry a wonderful selection of Earl Greys, not cheap but very much worth the money. Yes, it’s the cheapest of the 3 they have from this estate and it’s quite good, & takes milk nicely which is my prime requirement for a breakfast tea. I am pretty sure I have looked at l’Univers du Thé before, probably because you mentioned it (?) Your tea sounds lovely! I probably have mentioned it before, or one of their other teas. ???? I much prefer shopping for tea in real shops as mostly the staff is wonderful and knowledgeable, far more so than for perfume. Yes, I’m sure I’d rather shop that way too! No great tea stores near me unfortunately. Timbuktu today. I’m reaching the end of my 50ml and trying to decide if I need another bottle. I would be very sad not to have any, but my 15 ml bottle has lasted for AGES — I don’t reach for it as frequently as other things. But when you need it, you need it! Yes, my 50ml is probably from 2012. Still have about 10ml to decide though. I just love it though. Don’t hoard it! I was doing that with the last 5 mls in a bottle of Voleur de Roses and it went off. The more air in the bottle, the faster it spoils. Use it up and buy another! I just saw it massively reduced…it might have been fragrancenet and I am fairly certain that it was the 50 ml… I would check all the online retailers for the best price. Yes, I’ve been eyeing it for about $65. Just hard for me to place priority on something when it’s a replacement bottle. Some here – myself included – would argue that if you’ve managed to get through 50 ml of it, you need a bottle in your life. good point, I don’t think I’ve gone through 50ml of anything. Coin Op, you probably won’t believe me but I have gone through 50ml 400 times over…..keep in mind I have been wearing perfume daily since the early 1970s and I spray liberally!!!! Once you get over that feeling (to not pay for back-ups), the urge to replace can become surprisingly strong! I never bought back-ups, and then suddenly, I found myself backing up all sorts of things! OTOH, I have a pantry with not less than 20 pounds of flour, 10 pounds of sugar, and dozens and dozens of canned goods. It’s possible it’s in my nature to plan ahead for the hard times. I use lighter fragrances so easily! Last time I wore it though I thought it was turned, so I haven’t worn it in awhile. Smells great though. I am wearing Shalimar Initial and drinking a cup of English breakfast tea. You smell beautiful. Love this one. SPI and English breakfast tea = you have impeccable taste. SOTD is Etro Shaal Nur – seems to work well in the heat. I like Shaal Nur, and have found a few of Etro’s offerings to work very well with my skin. Messe de Minuit is my hands-down favorite from this line. I just finished a decant of Shaal Nur last week. It didn’t do much for me in colder weather but in the heat, it’s stunning. Yeah, I keep going back to it when I go out sniffing, hoping I’ve changed my mind. There’s something wonderful about it, but I don’t think it’s *me*. It is gorgeous in the heat. You smell great. That’s funny. I love Shaal Nuur, but to me it is a “wintertime” scent. I just finished my Frederic Malle – Eau de Magnolia. Woop more room for new purchases. Unrelated to anything, is anyone else here excited about this https://www.fragrantica.com/news/WPC-2018-Givaudan-Turns-Flavors-into-Fragrances-11008.html ? I’d love love love to try a maple-whipped cream – coffee – or black olive , beachy , herbal fragrance. Mmm, thanks for the link. Fascinating idea…I like the idea of a juicy, greener, non sweet strawberry. And congrats on finishing that bottle! ???? I think all the fruity fragrances on the market ruined strawberry for me – just like Cherry Coke ruined cherry as a flavor. All I have in my mind when I read straberry notes or cherry flavor is “sweet something with a pronounced plastic accent “. You smell great! One of my summer fragrance goals is to finish my little decant of Eau de Magnolia. Thank you! It’s really tough to finish a full one, regardless how great a scent is. but minis for the win! And thanks for the link – I’d loooove to smell that jasmine + black olive perfume. I had skipped over that line. now i’m intrigued too! oooh, sign me up for perfumes with notes of pear or peas. Thanks for sharing this. …no, i definitely do not enjoy smelling like bacon . Ha! bacon scent is a no for me as well. bleargh. Tiffanie, I’ve been wearing Pear and Olive this summer and LOVING it! Pear and Olive is a modern classic. Glad Slumberhouse brought it back for the summer. Leau de Kasaneka… can someone please retro fit this into the CP? The bottle is stunning…but the problem is it is so dark I cannot tell how much juice is left-LOL! I am enjoying it so I will just keep on wearing it and not worry about how much is left, right? Would weighing it help? If The bottle is fairly full, and then you measured the weight of how many ounces of water might be inside of it and then subtract it from what you anticipate the bottles weight is, nevermind ???? I haven’t smelled L’eau de Kasanka, but here my attempt to work it into the CP. L’eau de Kasaneka is inspired by the work of the artist Shozo Shimada. While Shimada seems to focus more on abstract portraits than BH Housewife, including Lady, which features a portrait from the shoulders up of a woman wearing black, white and red, his cubist style does fit in the overall modernist movement. 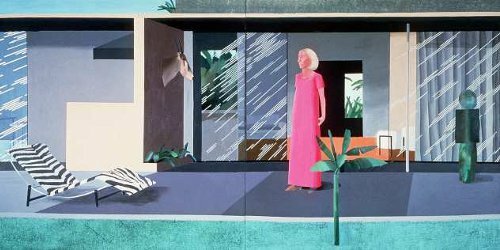 The same could be said of Lady, her geometrical black, white and red dress reflects the background of the painting, she is both part of the surroundings and the surroundings are possibly a function of her taste and decision making – but this is expressed more abstractly than by using multiple subjects. Maybe if L’ea de Kasaneka has notes that are very individual but work well together, rather than a more blended, symphonic perfume, all the loose ends of this analogy will tie up?? Now THAT is thinking! Coin-op, I suspect your services may be needed Friday if the comments above are any indication! Holy cow, you really put me to shame! not at all! Your tie in is spot on AND concise! Brava…and remember to go to the post office for scratch and sniff stamps! LOVE that teapot! I’m house cousins with Robin today in Eau de Hadrian – I always forget how pleasant it is. Eau de Hadrian is on my FB list. I really love it. You smell great! bite the bullet! it’s summer time and time to spray cologne lavishly! I see some decent deals on ebay, better than fragrancenet I think. Oooh, I haven’t even checked ebay! Wearing Twilly for the first time. I have a stomach bug, so I’m not feeling it. Too bwf. Twilly lost me when I spilled a few drops in my desk drawer. Now all my chapsticks smell like Twilly, and I hate it. This has happened on a number of scents for me. I need to really be careful when I travel with fragrance as something always seems to happen that the scent gets mixed with something and then it ruins it for me. One time at a duty free shop I sprayed Chanel No 19 Poudre onto a test strip and tucked it into my purse before getting on the plane. By the time I arrived at my destination, the vanilla chapstick that was also in my purse had absorbed the scent. Vanilla + No 19 Poudre. It was heavenly. Ick! Stomach bugs are the pits. Testing Vientiane on a gloomy day – a lovely dark chewy sandalwood; I might as well just move to Providence at this rate. Ha! I have been meaning to review that one for WEEKS, will try to finally get it done soon. Can’t wait to hear what you think! It’s not a buy for me since I burned out on sandalwood long ago, but I’m consistently impressed by the house. I got a split of it at the last splitmeet and it is a perfect example of woody notes that I cannot wear. It smelled quite delightful as I sprayed it, then within seconds of hitting my skin, I got this overwhelming raw-cut wood that is persistent, massive, and drowns everything else out. It’s a bit like being buried alive in a pile of sawdust. I had my husband try Vientiane and my nose had the same reaction, while he could not smell what I was talking about. So I’m assuming it’s some kind of response with my olfactory system. It’s not the only perfume that develops that way on me, and I’ve gotten to where I avoid woody notes (especially any mention of cedar.) I had a conversation with someone on another website who responds similarly and she chalked it up to a woody aromachemical commonly used in niche perfumes. Robin, or other perfume detectives – any idea what that aromachemical might be? Not sure but Providence Perfume is emphatically natural! Yeah, perplexed — I do think some of the synthetics have that effect on some people, but PPC is supposed to be all natural. It really does not have that effect on me at all. I’m sorry to be so little help, I just don’t know enough about olfaction! Wearing Lancome Parfait de Rose today as it was the only decant I could find as the packing gets more frantic !!! Ooooh, I have my I on that one, how do you like it? And, good luck with the move, so much work! I must have missed it, where are you moving to? Same town, but downsizing. When my hubby of 20 years walked, I kept the house. I now realize it is too large for my needs, and too difficult to maintain, so I have rented a floor through apartment 20 minutes closer to work. Someone else pays for heat and lights, and I don’t need to shovel or rake or stack 7 cord of wood by myself. Sounds great! Hope your new space quickly feels comfy for you and the puppers. That sounds really liberating. I hope it works out for you! Incidentally, when my H and I were picking some of our stored furniture up from his mother’s storage unit, one of her neighbors stopped by to chat. He’d moved into a 1 BR condo after downsizing from 2 – 2,200 sq ft houses. He said he didn’t want to leave his kids 2 houses full of junk to sort through when the time came. Enjoy your new space. It will be freeing I’m sure. Awesome! Lucky they pay for heat. Most of the apartments in my area started charging for heat. Good luck with the move! Hannahmom, I hope your move goes well. Hooray for no more outdoor chores! You smell good and good luck with the move! Wearing Tom Ford White Patchouli. It’s 95F / 95% humidity where I live. Small spray of WP blooms beautifully in the hella-heat. I’ve heard rumors of discontinuation. Hope not. To me, it’s truly unique. You smell great! I heard the same rumors. I keep almost getting a bottle, then I don’t.. I read it will be released in a new bottle, with a price hike (of course). So glad I found a back up bottle of FeA this winter for less than 65 euro! It´s great when that happens. I got most of my Serges at the start of my perfume hobby, around 10 years ago now. Prices were much more reasonable back then. My first bell jar only cost me around 100 euro´s. Have you ever tried Wazamba by Parfum d´Empire? It’s sort of similar to Fille, and I remember liking it better at the time both came out. Yes i think Wazamba is great as well! Fille en aiguilles is so much sweeter on me. It reminds me of my childhood holidays in France near the Atlantic coast – sunshine and pine forests, full bodied red wines and those cute Roman churces (incense). Wazamba smells more mineral and bitter (in a good way). Its more mysterious, right? Like a sacred ritual in a cave in a pine forest in the mountains, and apples are involved (or cider…yummm cider). This is exactly what FeA smells like to me! The pine forests in les landes on the west coast of France. Just smelled Agar Ebene again today. It is lovely and subtle. I prefer Cedre Sambac though, as I can smell it better. Back in Ormonde Jayne today with Tiare. Like yesterday’s Sampaquita, I think it goes with the painting (for the same reasons). I really like both but I think I like Tiare just a tad more. My son and his girlfriend are flying in tomorrow evening to stay until Sunday. I’m so excited to see them. I’m taking off half a day Thursday (I’m sure they will sleep in anyway) and all day Friday to spend with them. It’s making work tough because a) I don’t love work anyway and b) the anticipation of seeing my “babies”! Sweet! Have fun on your long weekend! Yay for you! Have a great visit! How wonderful – have fun with your guests. I hope you have a great time. Also, I’m turning my son’s gf into a little perfumista. I’ve given her so many samples and such lately and she loves it. She is excited to dig into my sample stash and such. Yay haha! Excellent! Sign her up on NST. Testing Kyse again – Fichi e Panna on one wrist, and Fumee Vanille on the other. Fumee Vanille is the clear winner today, with a very good balance between smoke and vanilla, five minutes in. I try with fig scents, I really do. I think I should love them. I love the trees, I love eating the fruit, I love the uniqueness of a fig perfume’s opening notes with the weird mix of fresh green and milky sap. Fig scents smell like nothing else on the planet. And yet, I just don’t want that scent on my skin. There are times I like to smell like wet earth, hot asphalt, hairy armpit, post-coitus, burning logs, and mildewy crypts. But not ever, apparently, like a fig tree. I feel you, fig is not for everyone. Hilarious notes though. And yes I rarely find a fig fragrance that I enjoy, despite thinking I *should* like them. Fig Tea from Parfums de Nicolai is an exception, probably because I smell more the osmanthus than any actual fig . Agreed, both on disliking fig scents but enjoying Fig-Tea because it doesn’t smell like fig (or fig leaf). Yep, it’s a note I do not enjoy but also feel like I should. Fig! What’s not to like? haha I almost feel the “fig ” perfumista peer pressure. I feel the same about Tauer perfumes. Absolutely unwearable on me, but …but …but …the cool kids love them…. and i want to be cool…. I’m with you on Tauer (if it makes you feel any better to have company). But on fig scents, have you tried Robin’s patented layering combination of Diptyque Philosykos over Tam Dao (or vice versa)? It’s really beautiful. I have not. And I do love Tam Dao. Must try, thank you! I can’t wear fig either. I love to eat figs. CanNOT do fig scents. It’s an automatic recoil for me. Wearing Je Revien (Worth) and enjoying it on a warm summer day. VERY warm here, and humid…glad you found the right scent! You sound happy. Enjoy your carefree day! ???? Love it! so summery and lovely! You smell very nice. That’s a good one. Believe it or not, it is still going strong. It’s creamy, coconut with a touch of floral. So nice on a warm summer night. Wearing LPDRosine Une Folie de Rose…from a generous sample from Kpaint. I love it! But, I think I love all decent Rose/Patchouli scents. Maybe there are some bad ones out there, but I love this, love Agent Provocateur, and my bottle of Moonlight Patchouli. My nose may not be refined enough to pick up on all the differences. I really wish I had some Caron Bellodgia to wear for the Community Project! I smelled it for the first time at Caron in Paris this April, and I immediately thought of a Beavery Hills Housewife from the 60’s, no joke! I have a decant of that which I wore the other night and thoroughly enjoyed. I get a bit hit of anise that’s airy and sheer, which had a nice cooling effect. I don’t know that I’ve ever worn it in hot weather but I’ll have to remember to give it a try. oh cool, let me know if you do try it in the warmer weather and what you think! I’m in Heure Exquise as it’s only 77 degrees here! We’ve had several days of much needed rain, and will probably get a couple more before going back into the weather oven. Goodness, that teapot is beautiful. Want. I’m envying you your weather today! I am overdue for a Harney order too! Go Poland, go! Our first match of FIFA World Cup is live now. I’m wearing Wonderly by The House of Oud. Not bad at all. You must be irritated. Bad judgment by that ref. Really bad. Sotd is No. 19, I think it matches the picture because it’s Chanel. All I can smell though is my coworkers Bright Crystal. She smells good, but hey, I want to smell my own perfume ???????? FWIW, I would rather smell your perfume than Bright Crystal, too! I, too, was originally thinking of wearing Chanel all week for the same “because it’s Chanel” reason ???? What are everyone’s favorite rhubarb perfumes? I was surprised by the rhubarb in Idyllwild. It kept playing peekaboo behind the cypress and fir notes. Ooh I still haven’t tried Idyllwild. Will put it high on my list. My ‘vote’ goes to Idyllwild as well! I prefer the rhubarb in Rose Ikebana to Ecarlate. I was going to say that I liked the rhubarb in Arielle Shoshana but I guess that’s passionfruit? They are kind of similar, though. Would you believe I’ve never tried Rose Ikebana in the 11 years that I’ve plunged into perfume world? I must try it this summer! I hear you on the rhubarb/passionfruit similarity. I wore the Ari EDP yesterday, and I love the first 30-60 min so much. Maybe I’ll take springpansy with me so we can overtake the SA. ???? Britt Red but I think it has been discontinued. Bought it for the bottle (to match the drained bottles of the regular Britt and Britt Gold) but fell in love with the fragrance too. Britt Red has long been empty but I still kept all three bottles. Oh interesting! I think I still have a decant of Brit Red. I don’t recall getting any rhubarb from it, but I’ll try it again. Thanks! I’ll try to search this week for the decant. I remember it most for its gingerbread note, but I think I haven’t worn it on years. Only rhubarb I have is a decant of the Aedes de Venustas. I haven’t decided how I feel about it yet, though to be honest. I like the tart fruity start and then I’m a bit more meh. . . I should pull it out in the heat and see how it wears. Argh I knew I was forgetting a top contender! The Aedes is my top rhubarb perfume! How could I forget? Perfumes de Marly Delina EDP ( not the Parfum) should be available at your big Nordstrom (is it the one with Chanel Exclusifs?). Anyway, I’ve got a little tin of Chanel minis, some Jo Malone samples, and a selection of random samples that either didn’t make it into boxes or had only a wear or 2 left to choose from. Today is the last of a YSL Trench sample which is a charming and effervescent woody iris. It is really delightful – so much so that I put it on and within minutes was looking into buying more. It even works for the community project. YSL and David Hockney were not only contemporaries, but mutual admirers and if not friends, knew one another. And the Beverly Hills housewife surely had at least one YSL caftan in her closet to wear poolside. Ugh moving! But your scent- story is pretty darn cool. I would love a YSL caftan to wear beside my fabulous pool. We moved twice in blazing summer conditions and each time my lipsticks (in the moving truck) survived. I hope you have the same good luck! Oh, I would also love a fabulous pool. That is very good to hear!!! I would also love a fabulous pool… and for someone else to take care of it for me I’ll take a YSL caftan as well – and a trench coat, for that matter! Try not to be stressed! I like your cp association! hope your perfume survives! and your skincare too! OMG… I am so paranoid I am making my husband drive my perfumes and lipsticks in the air-conditioned car all the way to California from Montreal this fall. Sending positive thoughts for your lovelies to arrive unscathed. Interesting, because YSL Rive Gauche was one of the ones I thought of for the picture, only I don’t have any! But did not know they knew each other. Very good luck on the move!! Hope everything arrives in a-1 condition. Good luck with the move, kpaint! Why is it that I’ve never heard of or seen YSL Trench until just now? I assume the fig is not prominent? 1) In Aromatics Elixir shower gel followed by Cap Neroli. The humidity and heat today needs both! 2) Sick boss, so iced cold brew coffee and his work. Sigh. 3) Go see the Incredibles 2, which is the best superhero movie of the year! And you will love the short that come before, Bao. LOVED the first “Incredibles” movie! It sounds like this is a worthwhile sequel. I’m wearing Madhat Mysore Lime. It starts out with a tart blast of lime and then the sandalwood comes forward. Great on a hot but not humid day. Ooh, that sounds yummy! Enjoy the weather! Ugh. Yesterday was absolutely Mediterranean with the humidity! I swear, every year the summers here become more and more like the midwest–afternoon thunderstorms and all! Yes, my brother in Seattle mentioned that it was HOT this weekend. When I was growing up there, hot was 80. I mean, that was really, really hot. ☀️☀️☀️ And thunderstorms were almost unknown. Very different these days. Head to the coast if it stays that way! Today’s SOTD is Chanel’s Coromandel eau de toilette. It’s only Tuesday and it’s been a looong week! I can’t wait until Friday comes. Long darned week here too, or long month, or long year, or something!! Happy day all! ☺️Slow morning here, temp is a little cooler so I enjoined A late breakfast outside. A couple apricot-walnut rugelach I baked yesterday and a cup of my tea blend from Adagio, strawberry flavored. ??? ?haven’t decided on a SOTD yet. I have been testing the sample of Cheesecake Hunting Saddle from ZOMG Smells and I really like it. Low silage,decent longevity ( about 4 hrs) and Miracle of Miracles my husband said it smelled nice! Poor man has been sucker punched by a lot of samples I’ve tried. Anything remotely floral hits him like an atomic weapon of hay fever destruction. It’s a thing of beauty when the hubby enjoys the scents that we wear! Cheesecake Hunting Saddle sounds downright pornographic 0_0 It’s really the name of a perfume? The rugelach sounds amazing! I’m always envious of bakers ???? Yep, ??? ?Really is a name. The ZOMG Smells has a lot of cool names for there fragrances and soaps. rugelach! love these! Such an easy, and yet very delicious, recipe to make. Yay for finding a scent you can wear around your husband! I am wearing Beige EDT today – I think that is is something the woman in the picture would have felt comfortable wearing to the symphony. It’s going to be 99 here today, so I’m curious how it will do in extreme heat. Stay safe, cool and hydrated everyone! OH, nice call — I think Beige is perfect. SOTM is Chanel No 5 edc, from an ancient decant. I have placed a bowl of neglected and “meh” samples and decants in my bathroom, to encourage myself to use them up. I figure I could wear one per day and pour one in the bath each evening, and still have leftovers at the end of the summer, but I’ve gotta whittle them down somehow! Yesterday’s sample of Eau Radieuse was surprisingly tingly on my skin (I think it was the mint). I have done that many times and then not cooperated with my own system — I am weak. SOTD is jasmine bomb Prima T edp. Also fell for the Klorane hair oil lemming of the day, and have that on as well. Its scent is not a hit with me. Generic florals are fighting with what honestly smells like cocoa butter. I will apply even more lightly next time to see if that works. Love jasmine perfume in the summer! Ooh, if you want a gorgeous jasmine-scented hair product, get thee some Lush R & B! It not only smells divine, but is a fantastic hair product, particularly for curly girls. It’s a super moisturizing oil-rich cream that works on my hair both wet and dry. You get an enabler pin. I love the scent of Lush’s Shine So Bright, but it always makes my hair look worse… it neither helps my curls curl, nor smooths them out. Just made my frizzying hair look look and feel dirty faster (but I love the smell!). Ugh, I’m so sorry! Did you have to buy it unsniffed? I did, but it was very cheap. Not to worry! I made the decision to buy it!! Thank you to the wonderful NSTer who sent me samples! It’s beautiful! ME smells very natural to my nose. Robin, ME does remind me of the old C&E Eglantine soap. It has the delicate combination of soft, fresh rose with leafy stems and twigs. LOVE the teapot today. Last week I watched Civilizations – Paradise on Earth on PBS which focuses on landscape art from around the world. 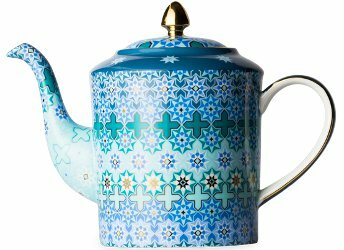 The geometric motif on the teapot reminds me of the gorgeous gardens and hand made carpets in the segment on nature in Islamic art. what do you think of Hermes ME? Myrhh Eglantine is very pretty. Highly recommend. It lives up to its name, smelling of transparent-resinous-rose. I like it and will sniff more today. I prefer to test a new scent on my arms but couldn’t find any unscented skin space. I had to spritz my knees, makes testing a bit more of a challenge, haha! that is gorgeous, thank you for the link! Oooooh, sounds like I’ve just added something to my “Sniff” list! Definitely worth looking for a tester bottle to sniff and find out if ME is the kind of rose you like. Oh yay! I did not adequately appreciate that soap back when I used it regularly. Same. I wish I had stockpiled C&E products back then. Stunning! I would love to visit one day. Spent the morning cleaning up after the puppy. She chewed a pair of slippers and got sick for some reason. Now that I am at work, I am in Avignon. Pretty sure I’d feel sick if I chewed on a slipper. Your SOTD is a good one for peace of mind, IMO. poor slippers, poor pupper, poor you! hope everyone is feeling ok this evening. moving to a house with a backayard soon where she can just chew squirells – if she can catch them that is! good luck with doogo. they are ❤️bit they do push their luck at times. also : i really want Avignon too! I’m wearing Malin + Goetz Cannabis today. It’s maybe not *quite* as much of a Timbuktu smell-alike as I initially thought (it’s a bit more floral), but I still think it’s close enough that if I use up my Scentbird sample, I probably won’t need to get more of it. The teapot up top is really pretty. Hey sweetgrass! I’ve been afraid to try this one as I don’t want to smell like weed. I’m back with a PSA for make up. Haughtlook has Edward Bess make up all under 20 dollars. No affiliation. I know some of you have said it’s pretty good. Never tried it myself. The lipstick is nice. I think that’s the only thing I have. Smellin’ flippin’ fine in Montale today with Vanille Absolu and Sweet Vanilla. It’s not particularly hot outside, only 90F… but the humidity is up and it feels a lot hotter. Bleargh. So I’m in Jacomo Silences pdt, for liquid air-conditioning. Wearing and all over misting of R&G Fleur d’Osmanthus with a few spritzes of Philosophy Amazing Grace Ballet Rose. Makes for a nice, refreshing, summery fruity floral. I held back my sample of Ballet Rose from the freebies pile! Yosh Sotille today. I imagine I smell like the floral arrangements that BH housewife has scattered throughout her house. Enjoying the headgear on the Egypt fans, but Yikes! Yet another own goal. Ugh. Being summer in 1000 flowers orange blossom petal, having approximately 1000 things to get done before I leave tomorrow to present at a conference! I smell light and breezy even if I feel the opposite, and I am going to be in some aggressively scent free spaces, so I should live it up now. Good luck with the conference presentation! Boo about scent free though. Fingers crossed that your presentation goes well! ???? Food luck on your presentation! SOTD = Miller Harris Fleurs de Sel, from the sample stash. This one smells much better wafting in the air around me than it does up close and personal. It still smells pretty darn good up close, though. It rained here overnight too but the heavy humidity was still lingering this morning. It was awful but blew out during the course of the day. Been on a long break from all things perfume this month! My mom had some complications after getting a pacemaker, and the last 3 weeks have been a blur of non-perfume ICU rooms and such. But she’s back home and doing awesome! Full recovery expected. During all that jazz, I really lost all interest in fragrance for a while…guess my brain was focused elsewhere. Slowly but surely I find myself getting back to it. Wearing Comptoir Sud Pacifique’s Vanille Abricot and a crazy mix of Bath and Body Works fragrance mists, because I just got back from buying some soaps and such! So glad that your mom is recovering well! Wearing perfume again is an added bonus. Your mom’s full recovery is great news! Sorry to hear about the health scare, glad your mom is better! I’ve been dealing with a sick dog all last week, stress and illness does tend to put perfume right out of your mind. Good to hear that your mom is now doing well, and that you are back in the perfume groove. When life truly and completely overwhelms, I tend to step away from the perfume. My appetite for fragrance (and food) tends to go out the window. Best wishes to Mom for ongoing improvement. Glad to hear you’re smelling great and sniffing good things. So sorry she had a hard time, so glad she is better! I haven’t made a comment on this blog for a while and I am late to the tea party but today I am wearing Neely Vermiere’s Niral. I sprayed myself at 8:15 this morning but I am still aware that I have it on. How do you like Niral? I have a few lame ideas about a scent for this week’s cp. But as several others have already mentioned, I don’t usually relate scent with art. Well, maybe if the picture was of something really obvious, like a rose or a lemon. ???? You could always use something obvious in the picture? The green plant, etc? Yes, that was one of my ideas. Darn you Robin! I don’t even use loose tea and I just bought a Charley Harper tea set from T2. It was half price so I had no choice! Also found a promo code for free shipping (T2WELCOME) so I really had to. No scent today as my migraine-prone husband is also working from home today, so I’m being nice and going scent-free. Hey, if nothing else but you switch to loose tea, I am doing you a massive favor, I promise! Plus now you really need a nice pot to brew your loose tea. You’re welcome. Oh wait, you bought a tea set, not a collection of loose tea! Duh, sorry. Well those are adorable and I didn’t even see them. Which one did you get? Those prices are VERY tempting. But I stand by my original comment — switch to loose tea, it really is better! I LOVE Charley Harper and at that price, I really had to. I have used loose tea before, but bags are just more convenient in a rush in the morning – or so it seems. I will definitely start buying some loose tea now to use my beautiful set! Oh NICE. I like both of the blue ones — the one you got and the one with the fish. Love the teapot shape and colors. The colors remind me of the Blue Mosque. Perfect for the summer and gives off a carefree yet with backbone California vibe. I must wear this more often! – Some people are oblivious to commuting “rules” — unless you have a timed ticket with an assigned seat, reserving a seat for someone else on a crowded train is in poor taste. Boarding the train on the way home yesterday, the woman ahead of me thought she found gold at the end of a rainbow when she saw an unoccupied two-seater. She hesitated to sit down so, since she was the first one there, it is her choice as to which seat she wants. It looked like she was committed to sitting next to the window but she was still standing and looking behind me. I asked her if she wanted to sit in or out (aisle), to which she said she was waiting for someone. Did she really think she can hold the seat next to her? I gave her my answer by sitting down. If there were many open seats (except the middle), I would have graciously chosen another seat. – The waist-length Hawaiian shirt you bought and wore years ago may still be in good shape; however, have you considered that perhaps it may now not be the right size? Also, I hope you realize that when commuting, it may be standing room only and that you may have to raise your arm to hang on to a strap or a bar. If you have not considered this, please do. No one should be subjected to seeing your belly, whether you have a 1-pack, 2-pack or a 6-pack — we are not at the beach. Ack! Your commuting woes never fail to make me shake my head. All you commuters who deal with this kind of stuff deserve an award. My train was 40 minutes late! I had signed up for alerts and there were no alerts. At the train station, there were no announcements other than misinformation that the train will arrive on Track X in 4 minutes for over half an hour. Express trains that could have made an extra stop to alleviate overcrowding was allowed to proceed on its normal route and passenger load. My train was already full when it arrived at the station but we were so how able to fit in more people which delayed the train further because the doors would not close properly. Anyway, so all told, it took me an extra hour to get home! Years ago, I had followed my aunt to the hospital. She came up from SC to see my mom. She got there ahead of me, and when I pulled in, she was standing in the last parking spot arguing with a woman in a car. My aunt was saving the parking spot for me, LOL. She would not budge! Finally the other lady gave up and left. This particular aunt is the one we call when we need someone on our side. She never backs down. ??? ?silently, though, i was mortified. I LOVE that story and your aunt. I love her too, just have to remember to always be on her good side! We may need a philosopher to weigh in — the woman who tried to park could have been there to visit her mother, or any other relative. My instinct would have been to block the spot and just lean on the horn until security came. What if it was a parking space for the disabled and you also happen to have disabled plates, who has more rights to the space – you because your aunt knew you needed it or the woman who drove up after your aunt claimed it? Well, I will tell you, that everytime my aunt comes “up north” she tells me how differently things are done in the south, so… idk, I’m a non confrontational person so even if I have the right to something, I more often than not will give it up to someone else. But it’s nice to have her on my side. Oy vey, big white hairy belly sticking out in your face on the train = yuck. :-0. You smell fantastic in Dune. The worst part? The guy works in my office but I don’t know him personally ???????????? I should wear your SOTD more often, too! Smelling great! You smell great! Sorry about commuting issues, though. It is not commuting-related, but I agree with unwantedness of body parts displayed wantonly in public. It has become fashionable for bits of bottom to peak out of the backside of very short shorts in these parts, and even when it is a lovely bottom, I find it to be distracting and unseemly. Each to their own, etc, but I personally do not care for the public display. ha ha, the only time I dared to try saving a seat on a commuter train was when I was heading into or out of the metropolis with kids in tow. ha again, my mum taught me to stand in front of the mirror before leaving the house, then lift my hands to the ceiling, and check that I was still covered at the waist. She loved to make clothes that had a precise fit and also loved seeing people dressed in clothes that fit well. I think people should give up seats for kids anyway and hopefully more would allow a family to sit together (with little kids…not teenagers — they can stand). You have a very wise mom ???? Happy Juneteenth! I was at a Juneteenth celebration this weekend, manning the adoption booth for the shelter. Nice turnout and it fortunately didn’t rain; a good time was had by all. SOTD is Library of Flowers Honeycomb which was quite nice until I did my cardio this afternoon, and then it just about knocked me out! Happy to hear that your adoption event had a good turnout! ???????? Checking in late, went on a whirlwind sniffathon in downtown Montreal today, came home reeking. I rather liked the Guerlain LPRN Ma Robe Hippie-Chic but alas, I am on a no-buy and it is a LE. I left the last bottle on the shelf. Sniff. Also spied the new JM Rose Musc, beautiful bottle, but all I could do is smell the cap as they have no tester. The SA said he would call me when he got one. Another LE, and $370 CAD. Yikes! I feel bad for the last LPRN on the shelf. To bad you couldn’t hide it until the no buy was over. They had four nearly full 100 ml tester bottles – I wanted to grab one and run! What is up with all these limited editions. I should get on a no buy but the last time I did that, I spent even more! I am fed up with the increasing limited editions, they only do it to push people to buy now, for fear of missing out. I decided not to give them what they want. where, where in Montreal? fellow co-sniffer here i only know of ogilvy in this city! Etiket, Holt Renfrew, Sephora and The Bay. thank you! I must go check out Etiket, it has a few lines I never tried! It’s blazing hot today, and so I’m wearing Mitsouko edt, hehe; yesterday it was Aromatics Elixir. The heat sure brings out different facets of these powerhouse fragrances! You’ll do well with next Friday’s cp. I love Mitsouko too but can’t wear it in hot weather. I’m checking in a bit late today. It’s been a long day of waiting for doctors to call me back. Still no news about the date for my hip revision surgery. I”m so depressed and tired of waiting for improvement after three months of problems and pain. Just generally very down. Sorry to vent here. I’m wearing Amouage Opus VIII because it’s beautiful. Thats awful that you are still waiting! Of course you feel down. I hope you get an answer soon. Remember, you are just as beautiful as you smell ???? Gosh, Calypso, you’ve been through so much physically and emotionally; I do hope you get the go-ahead soon for the surgery. And I agree with Lillyjo: smelling great makes you beautiful! I’m so sorry Calypso! I hope you get answers and relief soon. And, you do smell beautiful. Eeeks! Did your electrolytes (?) improve after drinking more coconut water? Yes they did improve, thank you. Thanks to everyone for your support. My problem now is that my surgeon has gone on vacation. I’m supposed to be scheduled with his colleague but it just isn’t happening. I don’t like having my life on hold like this. I hope you get a surgery date soon! So sorry Calypso! I would be down too. Hope they get you scheduled very soon. Hi Robin, since you mentioned Ceylon tea, thought I’ll leave a comment to let you know that Now Smell This has a reader across the world in Sri Lanka ???? Due to the time difference, I get to read your reviews late, but I really enjoy reading the honest and fun reviews on this blog.